Born in Davidson, North Carolina, in 1909, Opie Norris Smith was graduated from Washington and Lee University and received his M.D. degree from the University of Pennsylvania in 1933. Opie Norris Smith spent two years as an intern at the Pennsylvania Hospital in Philadelphia, two years studying Pathology at the same institution, and eight months in training at Duke. Smith moved to Greensboro, N.C., in 1948 and began practicing in the Jefferson Building. A year later, he partnered with Joseph Stevens, M.D. In 1942, they both became part of the Duke unit to serve overseas. Smith was an original member of the Duke Hospital sponsored 65th General Hospital with which he served in England for a year and a half. Smith later took command of a 7,000-bed hospital center handling captured German soldiers. He also served as Chief of the Medical Service Commanding Officer of the 196th General Hospital at Cherbourg. 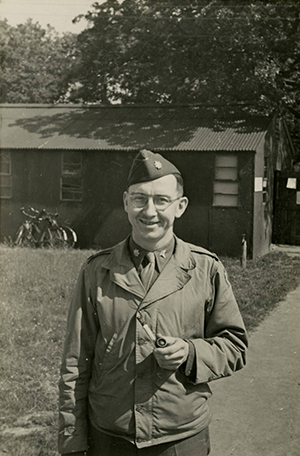 Norris was discharged in 1945 as a Lieutenant Colonel. After returning to Greensboro, Smith began practice in an office on North Elm Street, which he shared with other Greensboro Physicians until Professional Village opened up in 1955. In 1947, Smith was appointed first President of the newly formed Greensboro Academy of Medicine. He was later appointed President of the Guilford County Medical Society in 1954. And, in 1956, he was appointed President of the medical staff at the Moses H. Cone Memorial Hospital. Norris was appointed Chief of Medicine at the Moses H. Cone Memorial Hospital following P.A. Shelburne and served in this position for 9 years (1959- 1968). Opie Norris Smith retired from medicine in 1981. The Opie Norris Smith Collection chiefly consists of materials related to the Guilford County Health Services and the Piedmont Triad Regional Comprehensive Health Planning Council, 1966-1976. Materials include clippings, studies, project documentation, policies and procedures, budgets, annual work programs, and by-laws. The bulk of this collection will be digitized, but some items may not be included due to copyright or privacy concerns. may of these items may be available for viewing onsite at the Cone Health Medical Library. More about O. Norris Smith and the 65th General Hospital can be found in the selections from the Jacob Henry Smith Family Papers.